With a history that dates back to 1932, the Calatrava has been Patek Philippe’s signature dress watch for well over eight decades. Featuring a graceful slim case and a clean and legible dial, it’s not difficult to see why so many have fallen under the spell of the elegant Calatrava timepiece. Throughout the long history of the Calatrava, Patek Philippe has produced several iterations of the watch including the iconic reference 3919. Today we turn our attention to the classic Patek Philippe Calatrava 3919 to highlight what makes this watch stand the test of time. The Patek Philippe Calatrava is the definition of timeless design. Patek Philippe launched the Calatrava 3919 in 1985, thus replacing the preceding model, the Calatrava reference 3520. Although larger than its predecessor, the Calatrava ref. 3919 still sports a modest 33.5 mm case, measuring a mere 6.5 mm thick. 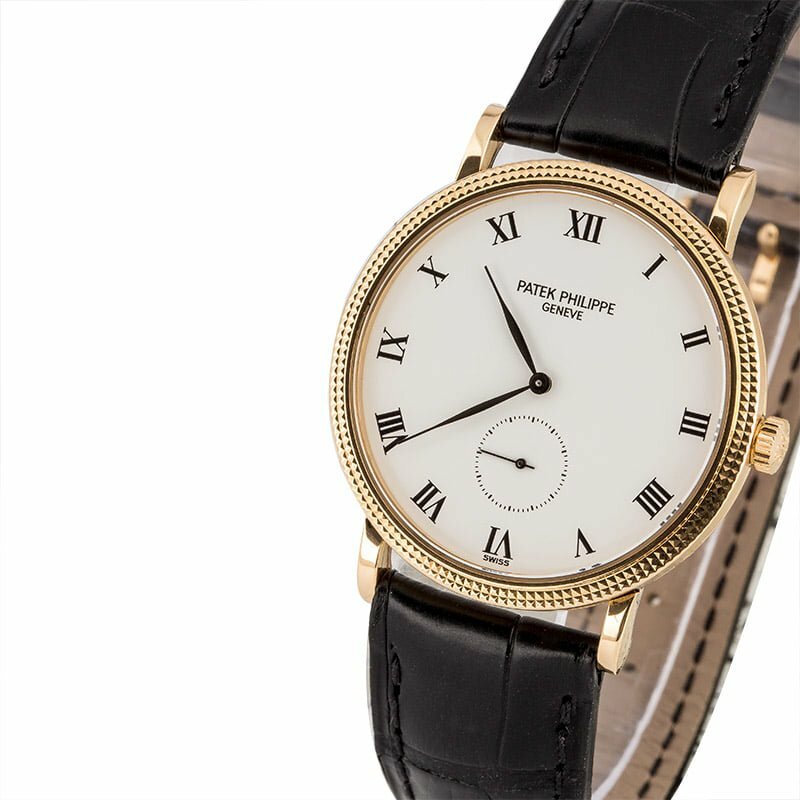 Patek Philippe made the Calatrava 3919 in three shades of gold: 18k yellow gold, 18k white gold, and 18k rose gold. One of the 3919’s most distinguishing features is its “Clou de Paris” (also known as hobnail) guilloché bezel. The 3919 was not the first Calatrava to feature this intricate bezel – that honor goes to the ref. 3520 – but it is a design trait that is closely associated with the 3919. The double layers of mini pyramid accents on the bezel framing the dial lends a striking design touch to an otherwise understated dress watch. Another feature that the 3919 carried over from its predecessor is the quartet of straight lugs that serve to attach the leather strap to the case. The Calatrava ref. 3919 is able to effortlessly slip under the sleeve of any shirt. New to the Calatrava 3919 was the manual-wound Caliber 215 PS movement, which subsequently added the running seconds indicator at 6 o’clock on the dial. Operating at 28,800 beats per hour, the Caliber 215 PS provides around 44 hours of power reserve to the Calatrava 3919. In true Calatrava fashion, the ref. 3919 houses a beautifully clean and symmetrical dial. On the crisp white lacquer dial, we see the traditional black Roman numerals, the small seconds sub-dial, and the leaf-style hour and minute hands. It’s important to note that the hands are, in fact, fashioned from white gold; however they are black nickel-plated to give them their darker color. After two decades of production, the Calatrava ref. 3919 was eventually replaced by the larger (36 mm) Calatrava ref. 5119 in 2006. While the overall appearances of the two watches are near-identical to the untrained eye, many consider the ref. 3919 to be the classic Patek Philippe Calatrava. While the reference 3919 Calatrava is no longer a part of the current Patek Philippe catalog, is it still a model that belongs on many watch collectors’ wish lists – and thanks to its utterly timeless design, it will almost certainly look just as good decades from now as it does today.